(L to R) Dr.Anjali Tendulkar, her parents Anand Mehta and Annabel Mehta, Sachin Tendulkar, Dr Sunil Bhat (Director and Clinical Lead - Pediatric Bone Marrow Transplant Services, Narayana Health) and Dr Purna Kurkure (Chairman Oncology Collegium and Head- Division of Pediatric Hemato Oncology and Bone Marrow Transplant Services at SRCC Children’s Hospital Managed by Narayana Health) at the inauguration of Bone Marrow Transplant (BMT) Services at SRCC Children’s Hospital, a super speciality tertiary care paediatric facility managed by Narayana Health, in Haji Ali, Mumbai. SRCC Children’s Hospital, a super speciality tertiary care paediatric facility managed by Narayana Health, launched Bone Marrow Transplant (BMT) services at the dedicated children’s hospital in Haji Ali. With the launch of BMT service, SRCC Children’s Hospital, will be able to offer the most critical treatment to children suffering from leukaemia and many other cancers as well as non-cancerous conditions such as Aplastic Anaemia, Thalassemia, certain neurological disorders etc. 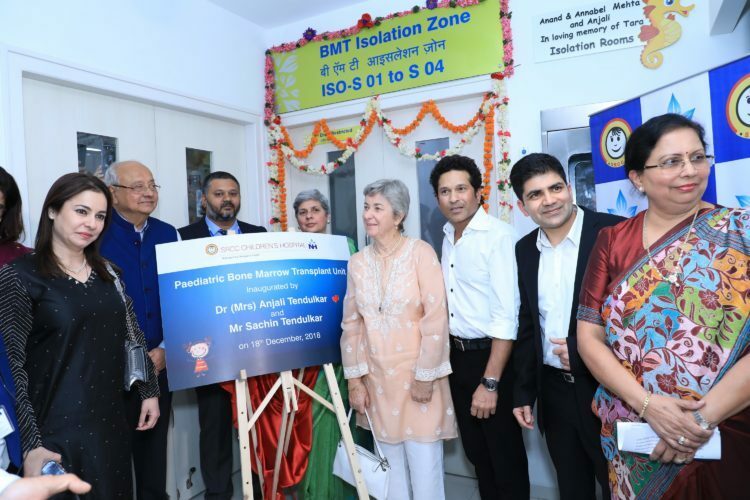 The BMT service was inaugurated by legendary cricketer and India’s Highest Civilian Award recipient Sachin Tendulkar and Dr Anjali Tendulkar. Their presence will help create awareness about how India needs more BMT donors to save the lives of lakhs of children. “Bone Marrow Transplant has evolved over a period of time and has become safer and more acceptable. List of conditions which can be cured with BMT is expanding. More and more patients are able to find unrelated donors through donor registries and those who don’t have fully matched donors can undergo half-matched transplants from family members, thanks to the technological advances. This has given a new hope for lot of these children affected with life threatening disorders”, said Dr Purna Kukure. BMT procedure helps in the treatment of various non-cancerous diseases like Aplastic Anaemia, immunodeficiency disorders, congenital storage disorders, congenital errors of metabolism and Haemoglobinopathies such as Thalassemia and Sickle Cell Anaemia. Few cancerous conditions like acute and chronic Myeloid and Lymphoblastic Leukemia, Hodgkin’s and Non-hodgkin’s Lymphoma, Myeloproliferative Neoplasms, Primary Myelofibrosis and Multiple Myeloma also require BMT as a solution for treatment. The team has also successfully handled a challenging half matched BMT for a boy with relapsed leukemia (blood cancer) from Nepal. There is lack of awareness about Bone Marrow Transplant and also it is very difficult to find donors. Bone Marrow Donation is a very simple process, as simple as a blood donation. According to Marrow Donor Registry India, at any time, all over the world, there are about 3,000 patients searching for a donor for a Stem Cell transplant and less than one third of these find a suitable donor within their family. Rest of the 70 per cent depend on unrelated donors. India treats approximately 1500 BMT cases every year which is far less as compared to other countries like China, Japan, Korea who are treating approximately 8000 cases every year. Cost of the treatment has been a concern and measures are required to address the same. Currently BMT is not covered under government health schemes including Vajpayee Arogya and Ayushman Bharat and a fraction of the support is available only through the PM/CM fund. Narayana Health is working towards making a representation to the government to include BMT under the national health scheme that will help bring a larger group of beneficiaries under the treatment modality.